On 5 April the Saatchi Gallery opened its doors to the most comprehensive and insightful display of the 50-year career of the legendary Rolling Stones with Exhibitionism. Some 2,100 visitors crossed the threshold on the first day - more than the first day at Chanel's Mademoiselle Privé exhibition last October, according to the gallery. Showcasing a tremendous, half-century career in one exhibition is no mean feat, not to mention ensuring over 500 artefacts of Rolling Stones memorabilia are displayed appropriately in the gallery's 1,750 sq m.
William Russell and Abbott Miller, partners at Pentagram design practice from London and New York respectively and recognised for their abilities to engage audiences with brand experiences, succeeded in the competitive interview process two summers ago in 2014 to claim the design role for Pentagram. Working closely with the band and curator Ileen Gallagher, they collaborated on an exhibition that will be remembered for years from now. DesignCurial met up with Russell from Pentagram and we took a look around the gallery at how they had designed Exhibitionism. 'Working closely with the band and curator Ileen Gallagher, we approached the space as if it were a set list for a concert,' says Russell. Exhibitionism is broken down into themes, steering away from chronological order often used, to create a less conventional exhibition and achieve a more immersive experience. 'There is a range of tempos, sensations and emotions that build into one orchestrated experience: it is tactile, authentic, glamorous, messy, and suffused with the sounds and images of the band,' says Russell, explaining that it was important to allow the band to tell their own story. We begin the tour and are greeted with 'Ladies and Gentlemen', a life-sized signage - the announcement preceding all Rolling Stones' shows - lighting up the first gallery with a bold entrance, silently gearing us up for the performance to come. 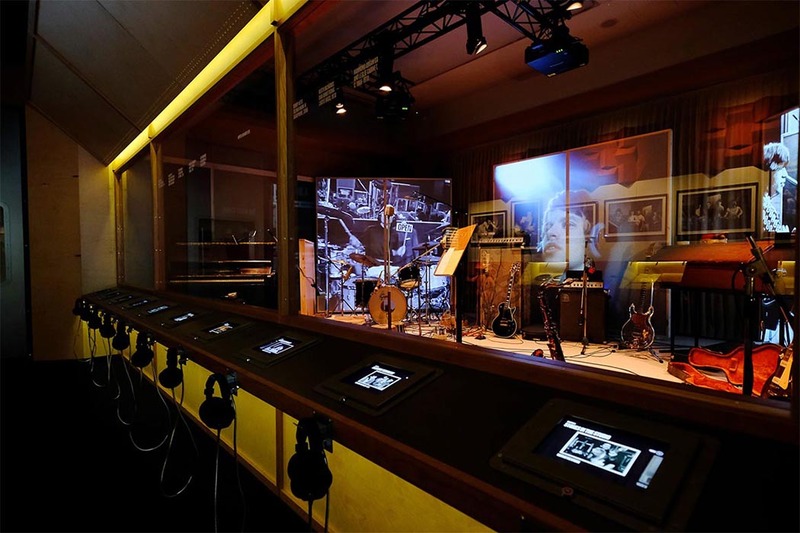 The connecting room sees a collection of multi-screens arranged in an arc across the length of the wall display footage from the Stones' career. Fortunately the Stones were always intent on making their impression in the media and documenting things on camera, making it easier for filmmaker Sam Pattinson to bring their story together. According to Russell, Rolling Stones band members Mick Jagger and Keith Richards absolutely insisted Pentagram recreate their first flat on Edith Grove in Chelsea. The impression that was given was that nothing was ever picked up, literally, until it became a pigsty. Humbly, Russell announces that there are no known photographs or documentation of the Edith Grove interior, so was forced to create the entire flat's interior using only the band's recollections. Russell worked in collaboration with installation and production designer Robin Brown, who is known for his work in Frieze Masters 2014 and 2015. The exhibit includes an astonishing collection from the Stones' career history, dating right back to the beginning. Rare guitars and instruments, unseen video clips, personal diaries and correspondence, artefacts from stage and set design, and much, much more, have all been dug up top go on display. 'They basically invented stadium design in rock,' proclaims Russell. Visitors can get a taste of stage design in the latter stages of the exhibit where there are stage models. These neighbour original sketched ideas for their own album covers, showing just how involved they were in every aspect of their promotion and development. Enter the Recording room, where a real impression of what went on is emphasised: guitars, drums and banjos are dotted about the studio with video footage playing in the background, all driving home the essence of being in the moment. IPads facing the studio allow visitors to pick and choose video bites to hear from the producers, band members and more about the characteristics of the Stones and how they worked. 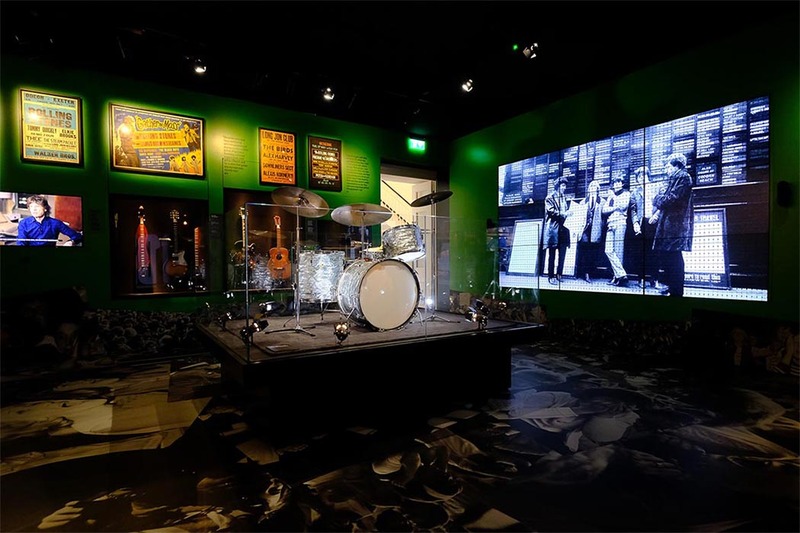 The Stones' iconic costumes are the only section of the gallery displayed in chronological order and exemplify how the band changed over time from uniformed clothing, a black and white patterned suit, to a colourful display of creativity, jumpsuits and all. Visitors are taken through the ages with a section dedicated to Mick Jagger's outfits he wore only to perform Sympathy For The Devil. Fiery red garments, fur capes, all cloaking jet black mannequins with protruding devil horns. Renowned milliner Stephen Jones collaborated on the gallery, working with the headpieces, and according to Russell there were more mannequins in this room alone than the entire Alexander Wang exhibition. Our final stop, after becoming well and truly immersed in the lives of the Rolling Stones, is Performance. A mock-up backstage takes us into the mind-set of being on the road with suitcases, racks and instruments strewn around the room. Donning 3D-glasses we head into the finale performance where, remarkably, a 2D video has been converted into a powerful 3D experience. Mick Jagger struts about the stage at a Hyde Park concert, the zealous crowd bursting at the seam. It's about time I find tickets for their next concert before these legends can only be re-lived through Exhibitionism as it travels to 11 other global cities after its stint in London. Visit the Saatchi Gallery for more information and tickets.